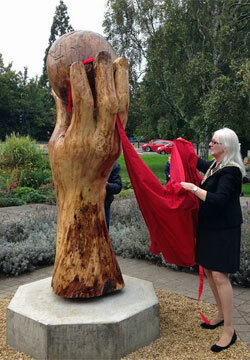 The Mayor of Grantham, Cllr Linda Wootton unveiled the refurbished Apple Sculpture before an invited group of supporters on 14th October 2016 less than 12 months from the start of the appeal for its restoration. 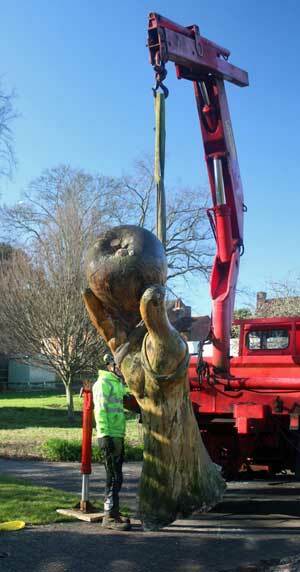 The "Newton's Apple" Sculpture in the Wyndham Park Sensory Garden has now been removed for preservation. The Isaac's Apple sculpture was made from the horse chestnut tree that stood there in 2010. The tree was diseased but not decayed and it's shape lent itself particularly well to the Newton-themed design. The wood of horse-chestnut is not naturally durable and being still rooted it is able to wick up moisture from the ground which will make it more prone to decay. It has lasted 5 years but is now sprouting fungal fruit bodies indicating the presence of internal decay though the surface wood still appears hard. The sculpture is now likely to rapidly decay and will not last much longer unless it is urgently preserved. To do so it has been severed at its base, and will now be dried out as much as possible and treated with fungicide and other preservatives internally. The stump can be ground out and a concrete base installed to which the preserved sculpture can be anchored. The apple is elm and is also showing signs of decay and also needs preserving. 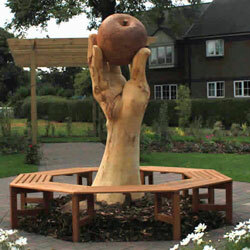 Wyndham Park Forum is appealing for help save the park’s iconic Apple in the Hand sculpture from further decay damage. The icon’s sculptor Nigel Sardeson has a solution to prolong the ‘Isaac’s Apple’ but labour, material or monetary donations are being sought to ensure the project can go ahead.It involves cutting off the sculpture at the “wrist” as close to the ground as possible to ensure the current wooden decay does not make the sculpture rotten. Park Forum secretary Elizabeth Bowskill said: “Even though it is a relatively new feature in the area, it would be missed by many people if it cannot be saved.“The Forum were aware when they commissioned the sculpture to be carved in the trunk of a living but diseased horse chestnut tree that it may not last for ever. “Fungal growths between the fingers and on the palm of the hand have now arrived and as regularly as these are cleaned away inevitably more grows back. The time has come to find a more permanent solution rather than lose the sculpture altogether. If the project proceeds, the sculpture will then be removed to Nigel’s workshop where he will dry it out and treat it to prevent further growth on the wood.In the meantime the stump and root will be removed and the ground prepared to receive the renovated sculpture.It is planned the hand will be mounted on metal supports which will allow air to circulate underneath which should prolong the life of the hand and apple.